Landis & Shoaf could push one another to new personal best throws at the Showcase. 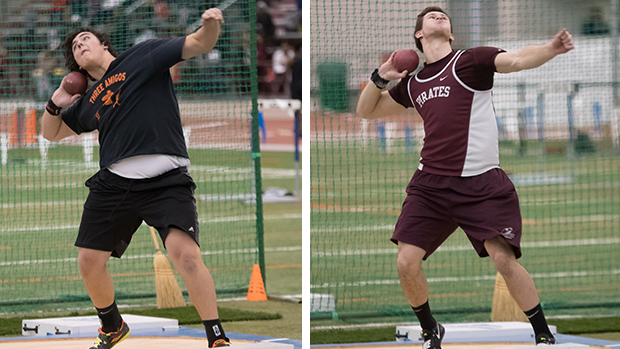 Among the more intriguing match-ups that are set for next month's SPIRE Showcase will be a duel in the shot put competition between nationally ranked throwers, Michael Shoaf and Nolan Landis. Shoaf is the current Ohio leader with a toss of 62-1.75, which he achieved at the Youngstown State Open back on January 5th. In addition to owning the state's top mark, he's stationed behind only Aiden Felty (Tyngsborough, MA) in the national rankings. In Shoaf's immediate rear view mirror resides Madison's Nolan Landis, who occupies the second spot on the Ohio list and number eight in the country by virtue of his 60-3 throw at the TSTCA meet in Pennsylvania earlier this month. The similarities between Shoaf and Landis don't end with the excellence that they display in the shot put circle, however. It's apparent to anyone who's spent time around them that they're both hard-working, humble and beyond determined to maximize their athletic potential. And they'll both be taking their talents to Indiana next year to compete at the college level, albeit for different big-time schools. Shoaf committed to Notre Dame and will join the Fighting Irish roster, while Landis is Bloomington bound to represent the Hoosiers. Undoubtedly the duo will square off down the road in the college ranks, but first things first - the SPIRE Showcase. Both are confirmed entries for the prestigious meet and both have a 'Showcase Title' in mind. Shoaf won last year and Landis wound up third, but this is a new year. Each competitor looks sharp in the early stages of the 2019 campaign with throws north of 60 feet and a hand-full of event wins between them, but there's one thing they haven't encountered yet - the competition that the other will present. That changes on February 10th. Both athletes have lofty goals established for themselves and they have strategic plans for how they'll accomplish them, but, admirably, the stress and excitement of competition hasn't made them lose focus on the ultra-important aspect of sportsmanship. Shoaf and Landis frequently take time out to credit the other for the push needed to enhance their own game and they celebrate one another's accomplishments. Their 'rivalry' truly is a friendly one. MileSplit had an opportunity to talk to Shoaf and Landis about their goals for the SPIRE Showcase, their goals for the indoor season in general and what their thoughts are on the other. My goal for the SPIRE Showcase is to continue building towards the end of the indoor season. Throwing my best at this point will be needed in order to contend for the meet championship. My goal for the indoor season is to continue to throw in the 60's and make improvements in my technique that will result in improved marks. Nolan is a great competitor and I always look forward to seeing a friendly face in competition. I am very excited to compete against him, as we push one another to throw further. Like any competition, I'm hoping to improve on the previous mark. The SPIRE Showcase is a little different in that it attracts an excellent depth of competitive talent, so it's also a goal to rise to that level, and try to come out on top. I learned last indoor season that it's really easy to get caught up in the idea that 'more is better' when it comes to meets. I had a lot of fun last season, and learned a lot, but I might have bitten off a bit too much by competing in 14 meets. So, for this season I'm scaling it back to no more than 10. The plan is to use the indoor season as a means to hone my throwing rhythm and dial in just the right amount of aggression to the throw. Like I mentioned earlier, you're always trying to move the mark, and that goal never changes, but the indoor season opportunities are a great stage upon which you can refine technique, compete, and prepare for when the weather finally breaks and we can get outside. I first met Michael and his family when we were in the eighth grade. My initial positive impressions have been consistently confirmed, and my admiration for Michael has only grown. He is the most accomplished thrower of our class, and that is not by accident. He is a talented, high level athlete who is also consistent, diligent, hard working, strong, and technically sound. He would make a great training partner, but unfortunately we live about 50 miles apart. I look forward to the few times a year where we can throw against each other, and I'm looking forward to the future when the Irish and the Hoosiers will get together for a tilt.